UPDATE: With inclement weather in the forecast for Jan. 15, the MLK Day Breakfast and Day of Service has been cancelled. Refunds will be available for those who purchased tickets in advance. The annual Martin Luther King Jr. Celebration Breakfast and Day of Service will be held Monday, Jan. 15, at Missouri Southern State University. Breakfast will be from 8 to 9:30 a.m. in the Billingsly Student Center Ballroom. Doors open at 7:30 a.m. The theme is “Stay Focused, Stay Committed … The Pathway to Justice.” The guest speaker will be Lyle Foster, assistant professor of sociology at Missouri State University. Foster is passionate about community, inclusion and empowerment. In 2015, he began the “Tough Talks” initiative at Missouri State to provide dialogue on issues of diversity and inclusion for students and staff. “Tough Talks” has been presented at other universities and even expanded to Community Dialogues in Springfield. He writes columns for numerous local newspapers, and conducts workshops on issues of diversity and inclusion. He was honored by the NAACP in 2013 by receiving its “Drum Major” award. The cost for the breakfast is $10 per person, and free for Missouri Southern students and children under age 5. 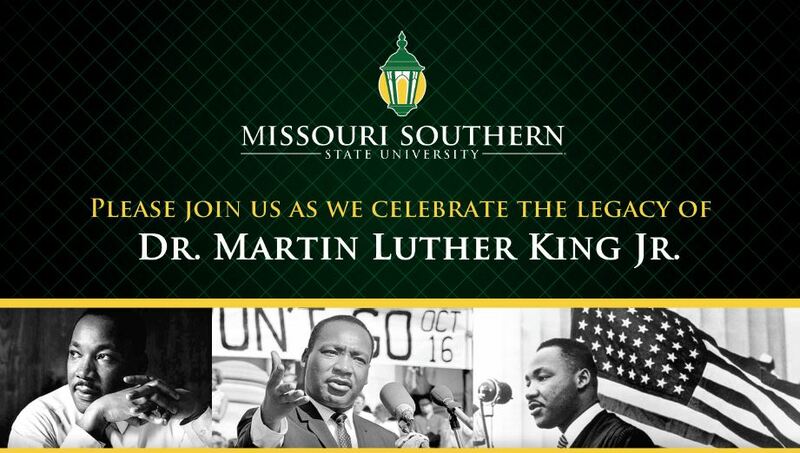 While the reservation deadline has passed, you can still register online at www.mssu.edu/mlk. Following the breakfast, the annual Day of Service is planned for 10 a.m. to noon and 1 to 3 p.m. Participants can select from a list of non-profits in need of service viewable at www.mssu.edu/mlk. Service times will vary by location and the website notes locations where children are welcome to serve. Contact the organization’s representative directly. Please note the times of service requested and the type of assistance needed. MLK Day activities at Missouri Southern are sponsored by: Commerce Bank, the Islamic Society of Joplin, the Joplin Globe, Owens Corning, Residence Inn by Marriot-Joplin, the MSSU Show-Me GOLD Program, MSSU, Student Veterans Organization, Missouri National Guard, Carver Birthplace Association, Fox 14/KOAM, South Joplin Christian Church, U.S., Bank, College Heights Christian Church, Joplin Area Chamber of Commerce, Joplin Metro Credit Union, NAACP of SW MO and Ozark Christian College.